For a technology guru, Steve Wozniak is pretty philosophical. Speaking yesterday at the University of South Florida, Wozniak spoke about his happiness equation which is basically “smiles minus frowns”. He addressed the crowd, more general population than students, as the inaugural speaker for the Business Thought Leader series for USF’s College of Business. He emphasized people over technology. Wozniak, inventor of the Apple computer, answered pre-submitted questions that asked for his best advice for college students and what he might tell his younger self. He responded that happiness was the most important thing in life and how you feel emotionally was paramount to any success you could achieve. He said if you have to pick between technology and people, always choose people. Wozniak emphasized his three Fs for food, fun, and friends. He also cautioned too to be passionate about your endeavors saying, ”the purpose should never be, this is how I’m going to make a lot of money.” Your purpose should be how can I use my talents to help change the word and make it a better place. Counterintuitively, Wozniak emphasized that goals were more important than knowledge. Having passion and a vision is key, he said. Twice Wozniak took a year off from college to work and pay expenses so his parents weren’t burdened. He had one year remaining when things got so busy with Apple that he didn’t return. Ultimately, Wozniak did earn his degree but at this point, he had gained fame with a recognizable name so he studied under an alias. His University of California Berkeley degree in electrical engineering and computer sciences is under the name Rocky Raccoon Clark. Wozniak described himself as anti-political and someone that does not vote but he has been motivated twice to go to Washington, D.C. because of net neutrality, interested in preventing big businesses with all of the money to control things. “I just don’t like that,” he said. Wozniak founded the EFF, the Electronic Frontier Foundation, which is a non-profit agency that defends digital privacy, free speech, and innovation. Keith Morelli, Communications and marketing officer with the Muma College of Business says the university had to move the location of the lecture because of the overwhelming response to see Wozniak. “The USF Muma College of Business Thought Leader Series was established to draw nationally recognized speakers, innovators, idea generators, entrepreneurs, philanthropists, authors and ‘turn-around artists’ in business and industry. Steve Wozniak fits all of those characteristics, making him the perfect person to kick off this important series. 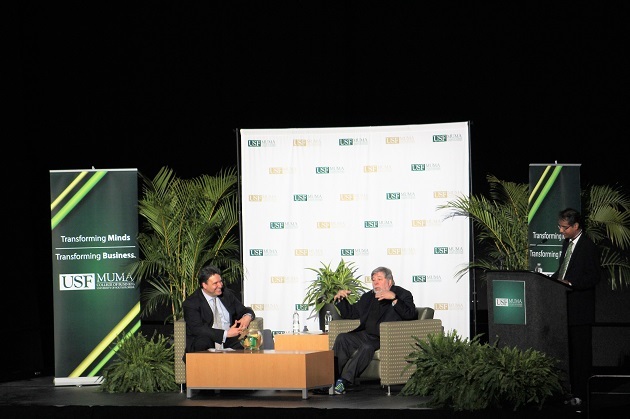 This event initially was to take place in the Marshall Student Center, but was moved to the Sun Dome because of the overwhelming response from students, alumni and the business and technical communities in and around the Tampa Bay region,” he said. Wozniak emphasized people over technology. He described the beginning of Apple as a revolution and said many young people are drawn to something that they can do to make the world a better place and for him, it was technical, "so I built this computer." Connect with 813area for more business news in Tampa. We cover guest lectures, local businesses and professionals and your subscription is always free!